Over the last few days I’ve been seeing a flickr group called The Items We Carry. I’ve finally contributed my own photo to the group, so you can see what I carry with me, pretty much all the time. I find this kind of thing fascinating. 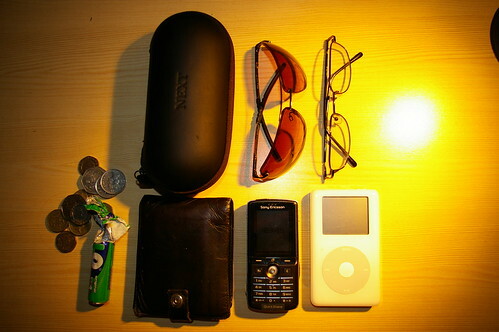 It really interests me what people carry with them, what they need to function each day, the techniques they have to do that. It interested me to see all the little systems that people have, and the more I look at it and think about it the more I realise how irrelevant it is. Instead of focusing on little techniques and systems to help “get things done” instead I and I would imagine many others, should be focusing on God and the relationship we have with him. The time spent looking at establishing little systems that, could and more probably should, be spent on getting to know the big feller, spending time in His word and studying it. It’s a big challenge, and one which I need to take up with more gusto than I have been, one which I pray I will be able to have the discipline and self control to do. I’ve been listening to Mike Bickle’s “The Power of a Focused Life” and it’s something that I feel challenged about and need to act on. Posted on 28th Jul 2007 10th Feb 2018 by Philip Bowell	in Thoughts on Life. Stumbled across you from the 100 Blogs in 100 Days. Nice looking site, and am glad you’re able to talk so openly about your faith, I need to practice that. Cell phone, keys, wallet (in front pocket = better back and no one steals it! ), Zune, and hacky sack, must be able to play hacky sack where ever I’m at. Nice to meet you Ben. Talking openly about your faith is certainly a challenge, but a good one! You’re a Zune owner, how are they? I’ve never come across anyone who uses a Zune, most people I find are iPod people. Aside from the proprietary software (but iPod has that too), I like it a lot. I can’t say the wireless has been useful to me (maybe it will in the future, who knows), but it does everything I need it to, and nicely. Though mine is in a hard case (I just dropped it twice on the cement w/i the past two days, yikes! but it’s ok), it feels nicer to hold than the iPod to me. The navigation on the iPod is nice, but this isn’t any harder or less intuitive. Anyways, hope to read more from you in the future, take care.